Finally home in rainy, snowy Calgary after almost 2 months of trying, not always successfully chasing the sun. After working up north for the winter I decided to head south to Arizona in the middle of March for some much needed sun and miles. I spent a quick week frying myself in the Tucson sun, followed by 3 weeks dodging snow and rain in Albuquerque, New Mexico. Halfway through my stay in Albuquerque I got a call from the Canadian mountain bike team coach Dan Proux inviting me to go to the second and third World Cups in Europe….heck yeah!!! But before Europe I had to suffer through Sea Otter. Every time I compete at Sea Otter I somehow forget just how painful it is, yet I continue to sign up for it…hehe, maybe a little masochistic. So that brings me to the World Cups. After a hectic night of packing and driving, I hit the airport for a long day of flying. After a long day of planes and airports I finally met up with the Canadian team in the Frankfurt airport. Two hours later we were in Offenburg. The course in Offenburg, Germany is amazing; I’d have to say it’s one of my favorite. The course is kind of like Terwilleger but a lot more technical. 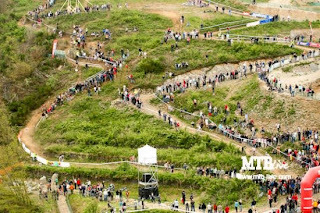 There’s plenty of flowing singletrack, big scary drops (first of which claimed me during the pre-ride when my front tire rolled off the wheel – good way to get the first crash of the season out of the wayJ), and crazy fans, oh yes, very crazy fans..But that’s a whole other story. With plate number 65 I was over halfway back off the 100 plus women starting pack. And the start, oh my goodness, I know I don’t have the intensity right now, but I really don’t remember the starts being this fast. After the initial shock of the starting pace, I was able to settle into a solid consistent pace. Fellow Canadian Jean Ann McKirdy and I jockeyed back and forth for a couple of laps and we maintained mid 50’s positions. In the final lap I managed to find a little extra gas in the tank and pass a handful of girls to finish in 52nd place, about 14 mins back from the lead. Catharine Pendrel had an awesome race finishing 6th place, and Emily Batty had an amazing breakthrough race finishing 9th overall and 1st in the Espoir category. Super great turnout overall by the Canadian contingency. From Offenburg we traveled the Monday after the race to Houffalize, Belgium for the third stop in the series. Houffalize is the oldest race on the XC World Cup circuit and it’s easy to see just how important to European culture. The course circles right through and surrounding the town of Houffalize. With the expo and all of the events of the weekend, the small town basically shuts down for the weekend, you can barely walk through town there are so many people. A slightly better call up of 58 out of about 110 really doesn’t make that much of a difference on the start of this course. Off the start we are sent straight up the main road though Houffalize, which turns off onto a 16% grade. The top of the climb kicks up even more and I taste blood (yikes) before the course turns off and we enter the first singletrack. I find myself in the 50’s again (though that totally didn’t feel like a 50’s start effort) for the majority of the race, but as Amanda Sin (Canadian rider for 3 Rox) catches me I make it my sole goal to stick with her. We jockeyed back and forth for 2 laps, picking off multiple spots. On the last climb I couldn’t hold her wheel and I had the metallic taste in the back of my throat again (oh my poor throat) trying to hold on. In the end Amanda finished in 43rd, and I followed 25 seconds later in 45th….yippee, cracked the top 50…and only 11 and a half mins back from the leader. Being dry this year, I have to say this is a pretty cool course, very challenging but very rewarding at the same time. My trip to Houffalize was capped by an amazing crepe with nutella, a chocolate coated waffle, French fries, coffee and a sausage on a baguette….yup, I’m on a diet now that I’m home. Awesome trip, really motivating and I’m extremely glad that I got the opportunity to travel with the Canadian team. Hopefully I get the chance again in the near future….like Worlds in Australia…now that would be super cool. Next though, Hardwood Hills Canada Cup, and I’m really stoked for the two Alberta Canada Cups, hope to see y’all out there…..Ciao.